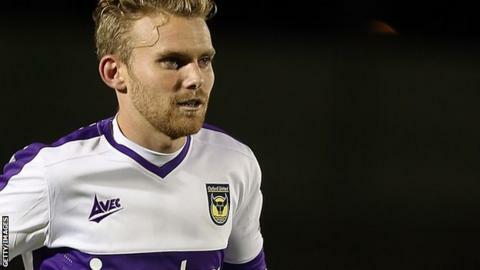 AFC Wimbledon have signed Alfie Potter after the winger left fellow League Two side Oxford United by mutual consent. The 26-year-old made 194 appearances for the U's after joining from Peterborough United in 2009, initially on loan. "My job is to get Alfie's confidence back and get him sparkling again," Dons boss Neal Ardley told the club website. "We wanted someone who could work a bit of magic; a player who could run with the ball and take players on." He added: "If we can get Alfie enjoying his football again and back to his best then he will be a fantastic signing." Potter, who last featured for Oxford in their 2-0 Boxing Day defeat against Shrewsbury Town, helped the club return to the Football League with the third goal in their play-off win over York City at Wembley in 2010. Wimbledon have not disclosed the length of Potter's deal at Kingsmeadow. Meanwhile, Dons chief executive Erik Samuelson hopes Ardley will remain at the club long-term. The 42-year-old, who has been in charge at AFC Wimbledon since October 2012, has been linked to the vacant Gillingham job. "I would love him to be our manager when we open up our new stadium," Samuelson told BBC London. "He's really committed to what he does here. I think he'd love to be that manager too but there are so many imponderables in life. "Let's just say we're both right now committed to that happening. Let's see what happens in the future."